People with autism on mental health wards in England are still being subjected to face-down restraint. The revelation has come two years after a former Government minister announced measures to end the controversial practice. Newly released figures show that almost one in five restraints (18.5%) in 2015/16 were face down. 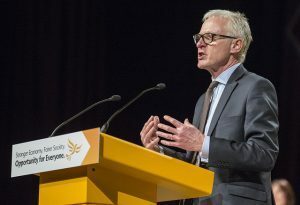 The government revealed the figures after former Care Minister Norman Lamb submitted a Freedom of Information request. This is a drop on the 22.4% of all restraints that were face down in 2013/14. But the reduction of just under four percentage points comes after the former Coalition Minister announced guidance to end face-down restraint within two years in April 2014. The Liberal Democrat MP for North Norfolk told of his disappointment over the figures. He said: “I find it immensely distressing, to be honest with you, because I know the impact that it has on individuals. Writing in The Guardian in May 2014 Mr Lamb said those in hospital with a physical illness would never imagine being restrained face down by staff meant to be caring for them. But for many who have a mental illness, a learning disability or autism, face-down restraint is a possibility, he said. Some health professionals maintain face-down restraint can be the only appropriate way of keeping staff and patients safe. Overall the total number of recorded restraints, including those that were not face down, rose by 16.6% from 2013-14 to 2015-16. NHS bosses said better reporting might be part of the reason for the increase. Professor Tim Kendall, NHS England’s national clinical director for mental health, said any hospital trusts not changing in a positive way “really need to take note”. “These are real human rights and ethical issues that they should be thinking about,” he said.